Genuine Venetian, this Cara Designer Masquerade Mask is made to order especially for us, unique to you. 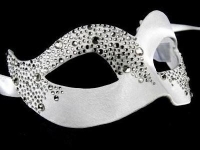 If you want to be different, to impress without arrogance, you'll appreciate the beauty of this masquerade mask. In black and red on a base of antique white with chequered patterning, this work of art is edged with the richness of gold and painted by hand in a matt finish (for subtlety rather than glare). Gothic inspired, the Cara is fashioned in true Venetian style. There's a hint of Venetian theatre in the Cara. The harlequin chequering is a steal from Venice Carnival character Arlecchino. Like every Simply Masquerade Venetian luxury mask, the Cara is hand made of superior quality in time-honoured tradition. For men and for women, the Cara will create a masculine or feminine effect to complement the whole of your themed party costume. You’ll find it easy to wear. It is light weight and ties comfortably behind your face to stay in place the whole evening. It is one of our range of fine, original masquerade masks, made in the custom and craftsmanship first pioneered in 16th century Venice. The annual Venice carnival (Il Carnivale) called for the lure, mystery and beauty of the masquerade mask and, thanks to the Carnival’s revival in 1979, is now famed the world over. Wearing the Cara mask you will bring Europe's biggest party atmosphere to your own celebration. And you'll want to keep yours as a piece of Venetian history, a souvenir with a difference. Made, as is the tradition, from papier mache over a plaster cast, and delicately painted to give the antique finish, the Cara is for you if you prefer hand not machine made, by artisans keeping an ancient skill alive today. Why not order today? Delivery is free throughout the UK.